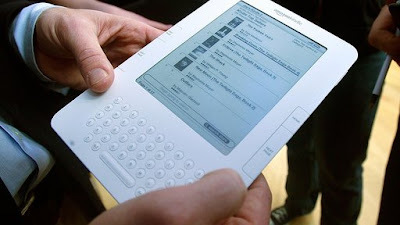 Mr. Duez's AVID Blog: Would You Want A Kindle? Would You Want A Kindle? Would you trade your textbooks for a Kindle? The price would be a great deal smaller for a school district that would be purchasing thousands of them. Interesting. NEW YORK (AP) — Amazon.com Inc. will release a larger — and more expensive — version of its Kindle electronic reading device that is geared toward periodicals and textbooks. During a press event Wednesday at Pace University in New York, Amazon founder and Chief Executive Jeff Bezos showed off the $489 device. It has a grayscale screen that is 9.7 inches on the diagonal, up from 6 inches on the regular Kindle. The new Kindle DX also includes a QWERTY keyboard like the current Kindle. The announcement comes three months after Amazon revealed a slimmer, updated version of the original $359 Kindle, which wirelessly downloads books. Some analysts have said the unit needed must-have content like textbooks to become more of a mainstream gadget. Three textbook publishers said they have agreed to sell books on the device. Would you want a Kindle instead of having to carry ALL of your textbooks?